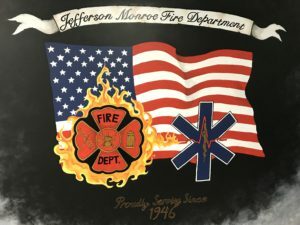 At Jefferson Monroe Fire department we are made of a wide variety of people and backgrounds. For those of you who have visited our facilities you have probably noticed the inspirational artwork in our upstairs entry and Weight room. Both of these pieces have been commissioned by one of our own. We want to introduce to you one our amazing first responders and talented artists. Yes that’s right she lives in Des Moines and in her free times makes trips back to our district to be available to respond to calls. See Interview below to learn more about Karen. 1. When did you join JMFD? I joined JMFD in April of 2013. I guess that makes next month my 5 year anniversary! Time flies. 2. What motivated you to join? I initially started volunteering in EMS at the age of 16 while I lived in Virginia as means of broadening my understanding of health care. During my senior year of high school my family relocated to Iowa. By this time I had realized I was very passionate about EMS and volunteerism and the first thing I asked when we were looking at homes was, “is there a volunteer fire department of rescue squad near by?”. Imagine how pleased I was when my family bought a house in Swisher that was a mile from the fire department. 3. You have created some amazing Murals at our department. Where did you get the idea? My aunt is an amazing artist. She once painted a massive mural that spanned the walls of a two floor stairwell at her church. 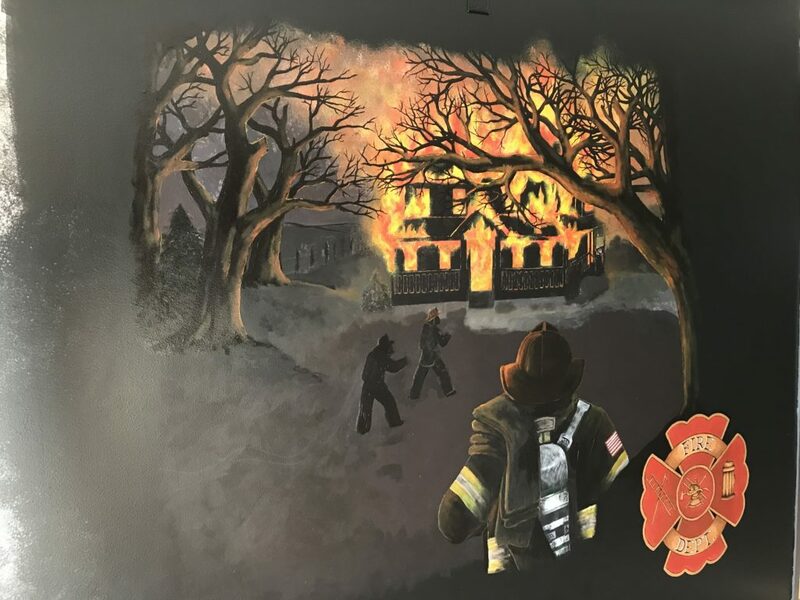 Remembering how awesome her work looked and how much I enjoy acrylic and mixed media painting I got the crazy idea to ask the Chief if I could paint a mural in the workout room of the fire station. Not surprisingly I was meet with some blank and vaguely apprehensive stares from the Chief and captains. I’m still not sure what made them trust me to do it but they told me to draw up a concept sketch for them to okay and then have at it! 4. What do the Murals represent? The first mural I painted was in the workout room. It was around the anniversary 9/11 that I started to really think of taking on this project. Understandably the ideals of patriotism and sacrifice embodied by the 343 firefighter who gave their lives in service that day stood out to me. I was hesitant to travel too far down the road of a 9/11 tribute because I was and still am a very novice painter and was afraid I would not be able to obtain the standard of quality such a weighty subject is due. Regardless I felt that a sense of patriotic pride has always been the backbone of the public service professions and a driving factor for volunteerism in America. Because of this I combined the Maltese Cross and the Star of Life within the backdrop of the American flag with the personalized touches of our departments name in a banner and year of establishment. The second mural I started upstairs between the Chief and captains office is still a work in progress. I wanted to paint a more dynamic, life like fire scene. I chose to paint the scene of a fully involved farmhouse at night due to our rural setting with the Maltese down in the corner. Once I’m done with the actual main content I plan to finnish fading out the edges and then going back in and write the firefighters prayer in the that smoked out area. 5.What else do you have instore for future designs at JMFD? That just remains to be seen. If I ever have the time or motivation I would love to carry the upstairs mural over the other door frame and add in an EMS scene with the Star of Life and the EMTs prayer. Maybe someday, right? 6. As a member at JMFD what is your favorite memory? I don’t have any one specific favorite memory per say. However, I have a lot of good things to say about my first memories and impressions of JMFD when I joined. 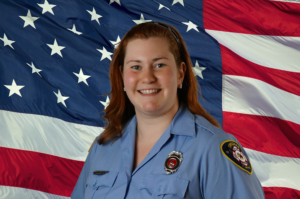 As I mentioned earlier, I had just moved to Iowa during my senior year and was very eager to join a fire dept or rescue squad as a way of regaining a sense of normalcy in my life by doing something I love. The members were so open and welcoming that I was almost caught off guard. I’m not sure what I was expecting but I was very pleased to be received so easily. I was very happy with how readily they accepted any skill sets I had and offered means for me to develop new ones. 7. What’s your favorite thing about being on the fire department? Obviously I love that I am able to be there to help a person during a very hard time in their life. I love health care and the role that EMS plays in it. That being said, there is also a lot to be said for the camaraderie and relationships I have built in the dept. I love that we have shared both good and very bad times together and come through the other side. There are so many different personalities and viewpoints with in the dept but I love that I know those differences will get put aside when needed to get things done or to give each other support when that inevitable bad call with no possible good outcome roles around. 8. How have your experiences at JMFD helped you in your professional career? I am currently working as a Registered Respiratory Therapist and completing prerequisites for medical school. I feel that my time as an EMT and at JMFD has helped me to develop a level headed approach to patient care in hectic situations as well as to be able to quickly read a situation for key points of importance and to act accordingly. Working with the broad range of personalities in the dept has also prepared me to be a player in diverse care teams as well as how to work with others in non patient care related elements.